Human Rights Watch on Wednesday urged United States President Barack Obama to tackle Indonesia’s leaders during his visit this week on issues including outbreaks of mob violence against religious minorities. The New York-based watchdog said that despite warming ties with Indonesia, Obama should be forthright when he meets President Susilo Bambang Yudhoyono during this week’s East Asia Summit held on the resort island of Bali. Local and international human rights groups have expressed outrage over light sentences handed out to members of a religious lynch mob who killed three members of the Ahmadiyah minority sect in February. The same court on Java island in August jailed one of the Ahmadiyah survivors of the attack, a man who almost lost his hand in the violence, for six months for defending himself and his friends. “The Obama administration’s deepening relationship with Indonesia means being frank about Indonesia’s serious human rights challenges,” said Elaine Pearson, deputy Asia director at Human Rights Watch. “Indonesian government indifference to mob violence against religious groups and brutality by soldiers against peaceful protesters are good places to start,” she said in a statement. Pearson called on Obama to push Yudhoyono to end discriminatory laws and protect religious minorities in the world’s most populous Muslim nation. “Obama needs to temper his past praise of religious tolerance in Indonesia with some tough talk on religious freedom,” she added. Indonesia’s constitution guarantees freedom of religion but rights groups say violence against minorities including Christians and the Ahmadiyah Islamic sect has escalated since 2008. In February, a 1,500-strong mob of Muslims set two churches alight and ransacked a third in the town of Temanggung, on Java island, as they demanded that a Christian man be sentenced to death for insulting Islam. More than 80 percent of Indonesia’s estimated 240 million people are Muslim. Five percent are Protestants and three percent Catholic. Human Rights Watch said Obama must address “the lack of accountability of security forces for continuing abuses” as well as the 90 prisoners in the restive provinces of Papua and Maluku jailed for peaceful political activity. 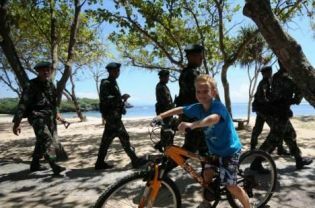 “Obama should point out that as long as soldiers who commit torture get a few months in jail while peaceful activists get sentenced for years, Papuans are unlikely to have faith in Indonesian rule,” Pearson said. Jakarta has faced a low-level insurgency in Papua ever since its 1969 takeover of the vast, mineral-rich territory which borders Papua New Guinea and has its own ethnically distinct population. Washington and Jakarta have reinforced ties in recent years, signing new trade agreements and strengthening military and anti-terror cooperation.